Classic winner Dawn Approach turned a nadir into triumph when rekindling the form that saw him win the QIPCO 2,000 Guineas. Clinging on by a short-head from runner-up Toronado, Dawn Approach took the St James’s Palace Stakes just 17 days after finishing last in the Investec Derby at Epsom. He gave jockey Kevin Manning a horrible ride that day, pulling uncontrollably, and while keen today the shorter one-mile trip played to his strengths when it mattered. When Bolger decided to run Dawn Approach in today’s race he sent Godolphin’s Simon Crisford a text that said: ‘Be prepared for a shock’. Bolger said: “Simon spoke to His Highness who said he would be very happy for the horse to run. Two weeks and a couple of days [since Epsom] isn’t too soon for me and the horse ate up and was very happy throughout that period. 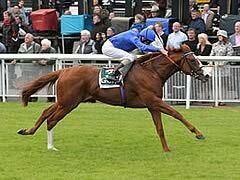 Simon Crisford, the Godolphin racing manager, reacted to Dawn Approach’s gutsy win over Toronado: “It is fantastic. “Jim (Bolger) called every shot there and got it absolutely right. It was a magnificent call on his part because it is the big race of the week. “It was a high-risk strategy and he pulled it off. Dawn Approach has achieved a phenomenal amount as a racehorse – an unbeaten champion two-year-old, a Guineas win and success in the St James’s Palace Stakes. “He is now destined for great things ahead at stud. I hear he got a hefty bump and knew that the stewards’ inquiry did not involve him. Kevin Manning has ridden Dawn Approach in all his starts. The jockey said: “When I pulled him out, I have gone there with plenty of horse but received a serious knock from the inside. There was then some contact with the horse on the outside. “I thought I had everything very much covered when I pulled him out. Toronado had to settle for second place after Dawn Approach was announced the short-head victor in a thrilling renewal of the Group One St James’s Palace Stake. This was after interference inside the last two furlongs when Glory Awaits drifted to the stands side forcing Magician, Mars, Dawn Approach and Toronado wide. 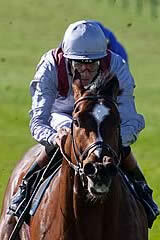 Richard Hannon, who trains the High Chaparral colt, commented afterwards: “That’s racing. At least he’s back! He’s a very good horse. Toronado is entered for the Coral-Eclipse at Sandown on July 6 and the Qipco Sussex Stakes at Glorious Goodwood July 31, as is Dawn Approach, and Hannon added all options are open.